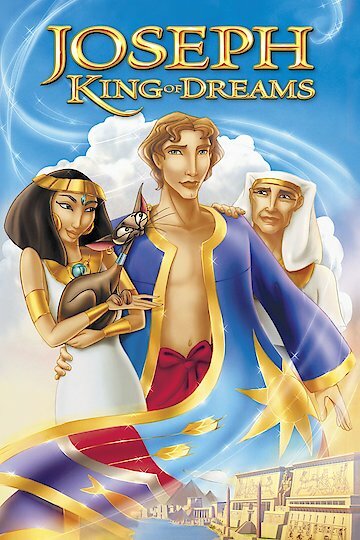 Joseph: King of Dreams – 2008, is a Biblical story from Genesis put into animated format. Joseph is a gifted man, loved deeply and pampered by his Father. This stirred great jealousy from his siblings. Joseph was closer to his father than his brothers and that made the older brothers furious. Joseph also had the unique ability to dream dreams that came true, which made his brothers feel threatened. They felt he would overtake their legal position in the family. They sold Joseph into slavery, taking his precious; “Coat of Many Colors” his father had given him and made false claims of this demise. Joseph went through trials, but God favored him, and he always landed in a favorable circumstance even when things went wrong. Joseph was given a job in the high powered house of Potiphar, played by James Eckhouse. This man trusted Joseph with his most precious possessions, but again, Joseph encountered a snag in his circumstances. He was found desirable by Potiphar’s wife Zeuleika played by Judith Light. Zeuleika falsely accused Joseph, and he was thrown into prison which led him to his next circumstance. Joseph interpreted the dreams of a baker played by Ken Campbell and a Butler played by Rene Auberjonois. Once the Butler was returned to his station in life, Joseph asked him before he left prison to remember him, but he forgot until the pharaoh had a dream that no one could solve. Joseph was summoned by the Pharaoh, voice of Richard McGonagle, and Joseph did interpret the dream. His reward was great. His ability to lead and organize did not go unnoticed by the Pharaoh. Joseph saw famine in his dream, which brought his brothers to him. Although, they had no idea that he was Joseph, and in the dream he saw in his younger year coming to pass. They were bowing down to him. This family was happily reunited after a rocky start, but forgiveness prevails. Joseph: King of Dreams is currently available to watch and stream, download, buy on demand at Netflix, Amazon, Vudu, Google Play, FandangoNow, iTunes, YouTube VOD online.